The refugee crisis which has consumed Europe in recent months has thrust immigration to the top of the political debate. Heart-rending images of migrants making perilous journeys from North Africa and the Middle East have added a new level of poignancy to the moral and practical considerations concerning mass movements of people. Calibrating the right response is critical, given that the pressures giving rise to the present scenario- conflicts and poverty-are unlikely to disappear soon. The questions raised for the UK are multi-faceted: to what extent should we limit the flow of migrants into Britain? How far should we collaborate with other EU countries on migration policy and how far should we go it alone? What criteria should we use for granting asylum or permitting the entry of economic migrants? To what extent should the interests of migrants and their countries of origin be reflected in these criteria? Never has there been a greater need for dispassionate analysis of how such large-scale population flows should be managed. 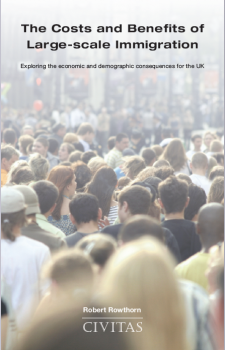 In this even-handed study, the distinguished economist Robert Rowthorn reviews the evidence about the costs and benefits of recent large-scale immigration into the UK. Contrary to the headlines generated by previous studies, he demonstrates that the fiscal impact is slight while the long-term demographic impact is great; and that while some may gain from large influxes of people from overseas, others-usually those with least say in the matter-stand to lose out. Robert Rowthorn is Emeritus Professor of Economics at the University of Cambridge and a Fellow of King’s College. He is the author of several books including De-industrialisation and Foreign Trade (with John Wells), and academic articles on economic growth, structural change, employment and migration. He has been a consultant to the International Monetary Fund, the UN Commission on Trade and Development and the International Labour organisation, as well as to British government departments and a variety of private sector firms and organisations.